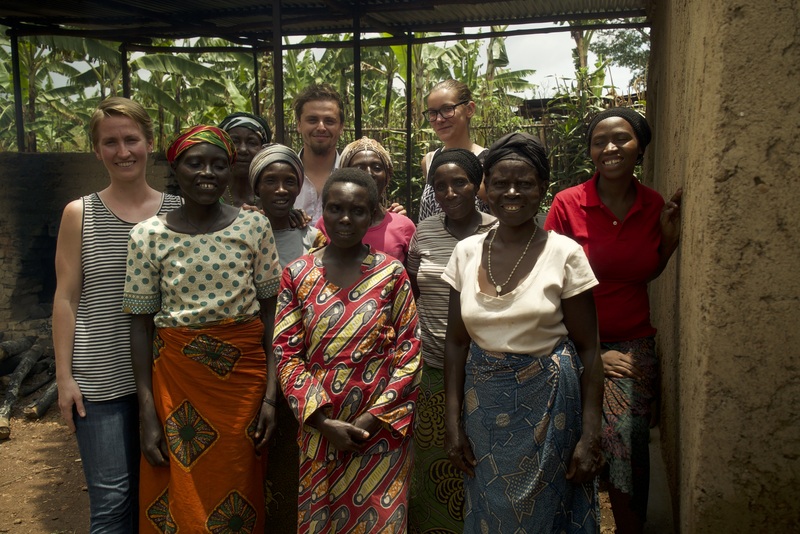 It was the fall of 2013, and University of Virginia alumna and Peace Corps volunteer Elizabeth Dettke had been in Zaza, Rwanda about eight months when local schoolteacher Christine Nyirahabimana approached her with an idea. Nyirahabimana, who grew up in the rural community about two hours southeast of Kigali, wanted to start a bakery to employ local single mothers with HIV, and she wanted Dettke to join her. Five years later, that collaboration has gone further than either of them could have imagined at the time. In addition to the bakery, their partnership spawned a documentary, “Zaza Rising,” being shown at festivals around the world this year, and an ongoing effort to help HIV-positive single mothers pursue an education and a sustainable income. Let’s start, though, with the bakery. Nyirahabimana’s initial idea was to provide stable employment for women who face many obstacles in the rural community. For example, though Rwanda offers free anti-viral medication for HIV patients, poor nutrition in rural areas like Zaza can exacerbate the debilitating side effects of the medication, which include chronic dizziness and stomach upset. Additionally, though the country’s HIV rate is relatively low – about 3 percent – there is still a stigma associated with the disease. However, Dettke, who was working in Nyirahabimana’s school at the time, realized that if anyone could help a community overcome that stigma, it was the bubbly, beloved schoolteacher. Nyirahabimana had lived in Zaza her entire life and was widely seen as a pillar of the community. She was bright, friendly, a leader in her church and at school and a married mother of two young children. Together, Dettke and Nyirahabimana began applying for grants, raising startup funds for the bakery and contacting local women. Duterimbere Bakery – the name means “to go forward with enthusiasm” – opened its doors in 2014, employing 10 HIV-positive single mothers who baked, packaged and sold breads, lightly sweetened cornmeal cakes and donuts. The treats proved popular, and within six months all of the employees had doubled their monthly incomes. However, like any entrepreneurship story, this one has its ups and downs. First and most tragic, two of the women died early in the venture. The bakery covered funeral costs for one woman after her family refused to pay. Around the same time, Nyirahabimana purchased livestock to ensure her employees would have a livelihood to fall back on if the bakery failed. Though for worthy causes, those large expenditures used a significant chunk of the fledgling business’ capital. A 2015 drought, which significantly raised commodity prices, did not help. “That nearly wiped us out,” Dettke said. By that time, Dettke finished her term in the Peace Corps and was working for an international development consulting firm in Washington, D.C. Despite the distance, she remained involved with the bakery and in close touch with Nyirahabimana. Together, they decided to close the bakery temporarily while they discussed what to do next. “Christine was really interested in pursuing further education to learn more about management and running a sustainable business,” Dettke said. To that end, Dettke reached out to a former Peace Corps colleague who manages The Women’s Bakery. A Kigali-based, for-profit social enterprise, The Women’s Bakery provides education and training for entrepreneurs developing women-owned bakeries in Rwanda. For about $20,000, Nyirahabimana and all seven of her employees could receive a comprehensive education in business, baking, nutrition and other skills that would help them make a success of their bakery. The result is “Zaza Rising,” a short documentary sharing Nyirahabimana’s story and introducing viewers to the seven HIV-positive women hoping to use the bakery to make a better life for themselves and their children. All funds raised from screenings of the documentary go directly to the women’s education. Dettke served as executive producer and enlisted her childhood friend, Lena Strothe – a Los Angeles-based filmmaker and marketer – as executive director. Other team members, many working pro bono, included cinematographer Aaron Grasso, composer Silas Hite and editor David Lizmi. “It was really nice to see everyone rally around this cause,” Strothe said. “From a storytelling perspective, Christine was just a really amazing person, a great example of one person making a change in her community. So far, Dettke and Strothe have screened the film at three film festivals this year: the Dances With Films independent film festival and the Women’s Independent Film Festival, both in Los Angeles; and the Pakistan International Film Festival in Karachi, Pakistan. As festival season kicks into high gear in the fall, they hope to add many more to that list. Most excitingly, they have raised $15,295 in donations – nearly enough to reach their goal and send all of the women to school, and plenty for Nyirahabimana to begin initial training with The Women’s Bakery, where she starts on Aug. 1. After the training, she plans to return to Zaza and relaunch Duterimbere Bakery. Like Nyirahabimana, Dettke is back in the classroom. She is now in her final year of graduate school at Columbia University, pursuing a degree in social enterprise administration. With it, she hopes to continue working with small businesses like the bakery, which she passionately believes have a significant role to play in combatting poverty and other systemic problems worldwide. Throughout, she plans to stay in touch with Nyirahabimana.